The closing of D'Angelo's restaurants across the state has created an opportunity for those who would like to start their own dining establishments. First, there was In N Out Burritos in Nashua and now down the road in Merrimack, Los Primo’s Mexican Restaurant is coming soon. They are opening up in the old D'Angelo space at 3 Amherst Road. NH Reviews stopped by to find out the status. The renovation process had just begun and they have a long way to go before completion. Inside we could see the team ripping down a wall in the distance. Taking a closer look, all of the tables had been pulled off their base and removed making the interior look much larger. In terms of location, Don Ramon is just down the street serving customers in the old Wendy’s. From that standpoint, the thought is that they are too close for comfort. On the positive side, Merrimack is growing so there should be plenty of customers for everyone. Additionally, they are right off the exit and can be seen from the highway going north which is important to attract travelers. 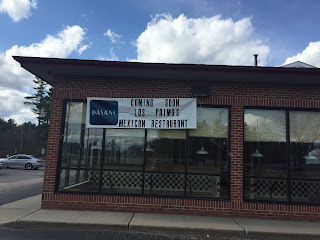 Los Primo’s will offer table service. The timing of opening is about 3 months.